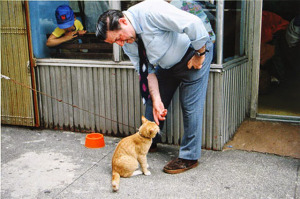 I’d lived on the same street as Gene’s barbershop for years and the one thing I knew for sure about Gene Wilsey was that he couldn’t much abide animals. He might be polite but that was customer service. “They’re usually dirty and smelly, crave attention, spontaneously bite you and cost too much.” His lips turned down in distaste. I’d bumped into Gene, arms full of groceries. He was shooing away a stray dog with his ever-present broom. The Labrador mix would have loved a treat and long drink of cool water. He leaned on the broom handle as I clumsily unlocked the back door of my sedan. Gene knew I could use help and, typical for him, he’d likely keep leaning on the handle until I said something. I wasn’t going to ask. I set one bag on the roof and yanked the door open. Then I stashed the groceries, closed it, and leaned against the warm blue metal. The late afternoon sunlight glazed everything with a golden cast as it began its descent. Gene looked a little yellowish which made me worry, even if it was just the light. He had had skin cancer three years ago. Was he hanging out in the sunshine again? I could hear mom fussing at him, informing him of the right vitamins and minerals, that he should wear a wide-brimmed hat in all weather and heavy duty SPF. She had affection for him even though they had a history rife with arguing, too. Now she was in a nursing home, too early but too ill, and Gene was in his late sixties and still working. He was done sweeping. The skinny black dog emerged from between a couple of cars and barked at Gene, then threw me a pitiful look as if he knew I’d be moved to do something for him. I checked my purse for cellophane-wrapped crackers I’d filched from a restaurant, but Gene swept the dog off his piece of sidewalk again. He barked back at the mutt and guffawed. I got into my car, disconcerted. He waved me off ith a grin, then went into his barbershop. I thought how Gene had visited my mother every single day as she was dogged by cancer and rallied with her when she got better. I had been eight when she first got ill, twenty-six years ago, but his presence had been a steady comfort in the evenings. There had never been anything formal about their relationship, no real indication they were a couple with a “C”. Mom was widowed when I was four and she remained a widow, while Gene had never married. Mary, mom’s oldest friend, called them “frenemies” since their arguing was as standard as their laughter. But I saw more. I was about twelve. I had finished homework early and went downstairs for lemonade and a snack. I heard the creak of the porch swing and the low murmur of voices as I filled my glass and peeld apart slices of American cheese. It was late spring, and a breeze that swept through the screened door was laced with lilacs and something else, something with a tart edge that made my nose wrinkle up a bit. I went to the door and peered out. Gene was sitting by my mom, his arm stretched out around her shoulders, hand hanging off the back of the swing. They were pointing at something in the yard, probably talking about her prized irises and he chortled, then leaned closer to her. She turned her head so that they were almost nose to nose. I held my breath. Bees were buzzing away around their feet. Traffic had stilled and nothing moved but the bees and that swing, a slow, easy movement as their feet pushed off and then lifted, pushed and lifted. Mom slowly turned her head back and looked across the lawn but Gene still focused on her, as if dazed. In a sudden shift, she looked as if she might put her head on his shoulder. I felt everything tighten, my forehead wrinkle. That weird smell was cologne, men’s cologne, and Gene was tidier than usual, a nice blue shirt with tie and black pants, polished shoes. I wondered where he was going, why he had stopped by. I slurped the cold lemonade but it didn’t get all the way down. I coughed. They turned my way just as I stepped back, then ran up to my room, lemonade spilling with each step, the cheese slices sliding off and sticking to the wall. When I got to my bedroom, I put everything on the floor and grabbed my pillow, my face squashed into it. I laughed and laughed but before I knew it I was sniffling with a few tears. I didn’t know why. I just felt scared and happy and uncomfortable all at once. Gene had been a neighbor (two blocks away) and a hair cutter when I was little, a handyman when we needed it. Definitely a good friend to my mom and like an uncle to me. But it didn’t make sense that he’d be sitting so close to her, arm around her back. Or maybe it did. I couldn’t get it straight in my head. It was like he belonged with us but apart, need to be there in a way that wasn’t quite as close as that. Plus, they didn’t get along half the time. They had different politics, mom had said, as if that explained everything. Mary said he was “a Catholic plus too damned conservative” but mom shushed her. We were Methodists and mom voted independent, she’d said, and that was the end of any more questions. But they played canasta every weekend and he mowed the lawn sometimes, things like that. He took her to doctor apointments when he could. He was just around. I still smelled the acrid but sweet cologne; it made me want to wash my face. If I pushed against the screen window in my room, I could see the edge of the porch so I took another peek. Gene was in the yard and mom was walking him toward the little weathered gate in our fence. He reached for her hand and she let him take it. Then they laughed and it was dropped like a hot stone and he left. I saw him look back as he walked but mom was already on the porch, then I heard the screen door slam. I thought she might come up to talk to me but she didn’t. I got a towel and cleaned up the spills, took the cheese off the wall and carpet, and deposited it in the garbage in the kitchen. She was whistling, something she often did, and smiled at me, making me feel right and warm again. But she didn’t say a word about his cologne or anything else. Later I learned from eavesdropping on Mary’s conversation with mom that he’d had a wedding to attend in a neighboring town, a second cousin’s. And he had asked mom to accompany him. I was on the couch reading. Right then my chest expanded with a huge intake of air, like there was more room inside again. But all afternoon I wondered what their talk had meant. Finally I decided it was grown up talk riddled with secrets I wouldn’t get even if they was spelled out. It did make me think of her differently, as if I saw she was a person beyond being a mother. Someone I didn’t know as well as I’d thought. Gene, too, which was almost more strange. Life went forward, mom got sick and better off many times, Gene was here and there. After I’d chastised him about the dog that day I ruminated about his life. If he was lonely. If he had a good retirement saved. If his skin cancer was really gone and if he planned on working until he’d drop over. He loved his barber shop. Despite all the salons that had sprung up over the years, he’d seen barely a dip in revenue. The old men wouldn’t abandon him. They loved gabbing about sports and yard care, cars and women and grandkids. There were newer customers, though, even up and coming businessmen. The shop had a clubby air to it, a little dark with leather chairs, smokey. Coffee on tap, cold beers for later in the day. I had seen a few young women come and go but Gene’s spot meant old-fashioned shaves and haircuts. I had liked visiting him when I was young. Since then I had become a lawyer, been married briefly and divorced and Danny was in college. I saw Gene maybe every month or so, usually running into him on my days off. Things were different between us, sure, but also the same, I thought. I hoped. One Saturday morning I paused on the sidewalk, checking the To Do list on my phone. I stood across the street from the barbershop and was drawn to the sound of Gene’s boisterous laugh. I ran between cars stopped for a light, the stood still at the edge of the sidewalk. Gene was bent over, gingerly reaching out to a cat on a leash. The woman on the other end of the leash was looking impatient now rather than sympathetic. Who stopped a cat owner and told them he was traumatized by cats? She didn’t know Gene or she would have come back at him with something. The cat led the woman away. We entered the shop. There was a little boy waiting to get his hair cut, his father sitting with a magazine. And that’s when I saw the stray dog lying on the floor, chewing on a toy. His coat shone. Gene picked up a comb. “Ready for a fresh look, buddy?” he asked the boy, and the child hopped into the chair. “Oh, I fed him a little then more and more. Beggar! But I had to. Rocky was so skinny and pathetic.” He ruffled the boy’s damp hair and the two grinned at each other in the mirror. “He cleaned up nice, though, right? The dog got up and came forward for a sniff of my hand. I got a beer and watched Gene work with the boy, chatting about video games and comic books, Rocky wagging his tail at me until I petted him at great length. The dog was spoiled from all the attention. More customers arrived and joked with Gene, ruffed up Rocky’s handsome head. I finally stood up and tossed the half-empty beer can in the trash. Rocky grabbed it, started to lick it. Everyone chortled as I slipped out. I nodded in agreement. But when the tears prickled my eyelids I wasn’t ready for them. The bright blue-sky day, the hum of his barbershop, Gene’s new dog friend, Rocky–it felt golden and righteous good. It was a moment I’d keep with me, like when he and my mom swung on the porch swing during a good, healthy spell, when life for me was transparent and mysterious all at once. It still was. Here was Gene and his small kingdom, his surprising kindnesses, his gift for welcoming other underneath the gruffness. How could I forget? I resolved to spend more time with him, invite him over for dinner, go for walks on days off, whatever he’d like to do, even fish. Not just for mom or him, but for me, the kid who was given love by a good man who was just always around, when I didn’t even yet know it was love. It was high time to let Gene Wilsey know I saw him but also wanted to know him better. I was a grown up now, had changed some. But he still mattered to me. He was such a humble and worthy man it shook me up to think I might have taken him for granted. I figured Rocky might feel a bit more loyal to him and I wasn’t going to let a dog–even a good street dog– outdo me. I had more to share with Gene, more to appreciate in him. I suspected he had been waiting for me to just remember.